As a physician who has patients with cancer, you know that those 3 words “YOU HAVE CANCER” changes lives in a heartbeat. You know that even after you’ve done your best to reassure and guide them, they still have to go home and deal with the overwhelm, the fear, the sharing with their loved ones and with the personal, medical, professional and financial decisions and adjustments. This is where partnering with a qualified cancer coach can make all the difference. As a registered nurse and qualified, experienced professional cancer coach, I welcome the opportunity to provide that much needed support, education and assistance to patients and their loved ones. This enables you to utilize your time and expertise with patients as efficiently as possible. Become A PAID PHYSICIAN PARTNER for my powerfully effective and affordable 4-week virtual live cancer coaching class. You will enable your clients to get additional support that compliments your own expertise. Partner details: You are provided informational brochures and everything you need to easily enroll appropriate clients into the program. You receive a portion of the class tuition for providing the marketing and enrollment process and any follow-up you choose. This partnering program offers you cash-based income without any upfront or ongoing costs to you. And this is for no upfront or ongoing cost to you …and your clients will thank you. * if you offer medical or psychological treatment, you will need to have your patient fill out a HIPPA form before sending their forms to me. Support them in becoming their most empowered, authentic self. So what exactly does Susi provide as a Certified Professional Cancer Coach? I address essential components that patients face before, during and after their active treatment to create optimal internal and external environments for best outcomes. I assist your patients in making sense of their journey, discovering new strength and meaning and providing stress and fear-reducing psychosocial and mind-body tools for ongoing support through their journey of healing or surrendering. 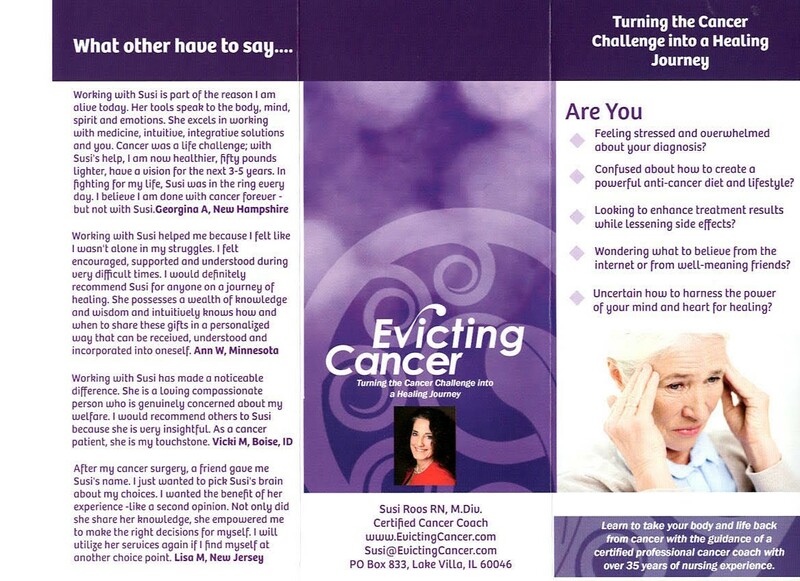 Identify clients who could benefit from my 4-week virtual live cancer coaching class. If the client is interested, either open up your link and help the person enroll right there or email him/her your link so that the person can enroll him/herself. That's it. Upon completion of the program, your patient can share a report with you about what s/he implemented as a result of the program and you can then do appropriate follow- up and reinforcement. For your introducing the program, enrolling and following up with your client, you will receive an administrative/consulting fee of $100.00 out of the $199.00 program fee. Why is Susi Roos, RN, M.Div, qualified to be a valuable resource for your patients? Susi has been a registered nurse for 40 years. Through 10 years of assisting oncology patients in both nursing and mind-body capacities, Susi has identified the patient needs and challenges not being met by even the most compassionate and competent oncologists. As a nurse, she saw how ill-prepared many of the patients are for the challenging effects of cancer treatment and how they are rarely taught what they could do to minimize them while supporting their bodies to achieve better outcomes. As a mind-body specialist, Susi recognized the debilitating effects on quality of life and treatment results when fear, stress, hopelessness, helplessness, guilt, shame, sexual dysfunction and poor communication among loved ones are not addressed in empowering ways. was trained and certified by the NAPCC (National Association of Professional Cancer Coaches) which developed a comprehensive 3 level evidence-based training program offered to registered nurses, nutritionists, psychologists, naturopaths, oncologists and other physicians. studied with integrative medical doctors, naturopathic physicians, nutritionists, psychotherapists and others with various types of expertise in cancer care. These studies took her to Mexico, Switzerland and Germany. Is certified as a functional diagnostic nutrition practitioner and additionally went through a certification training at the Raw Food Institute. Today, Susi partners with her clients and their oncology team to provide the best outcomes with the least debilitation and the greatest personal empowerment and healing possible. Learn what her clients and patients have to say about her work. And then consider offering the same opportunities to your patients. They will thank you. Click here if you’d like to contact Susi for more information about this partnering opportunity or to learn more about her other coaching services or to arrange for her to speak to your patients.